Victorian Christmas at Heritage House Dental turns nine years old this year! This event has become a favourite family tradition in Mississauga. If you have been to one of our previous Victorian Christmas celebrations, we would love to see you again. If you haven’t attended one yet, come and see what all the fun is about. Enjoy live Christmas music throughout the day, and have your photo taken with the famous jolly man himself, Father Christmas. Of course, no celebration is complete without yummy treats, so we will have lots of those as well. See below for our agenda and mark your calendars for some festive family fun on December 16th! 12:00pm – 4:00pm Pictures with Father Christmas. Victorian era inspired refreshments will be served throughout the day’s festivities. Write your Christmas wish list for Santa or bring your own letter to Santa. Enter to win a Christmas gift basket. 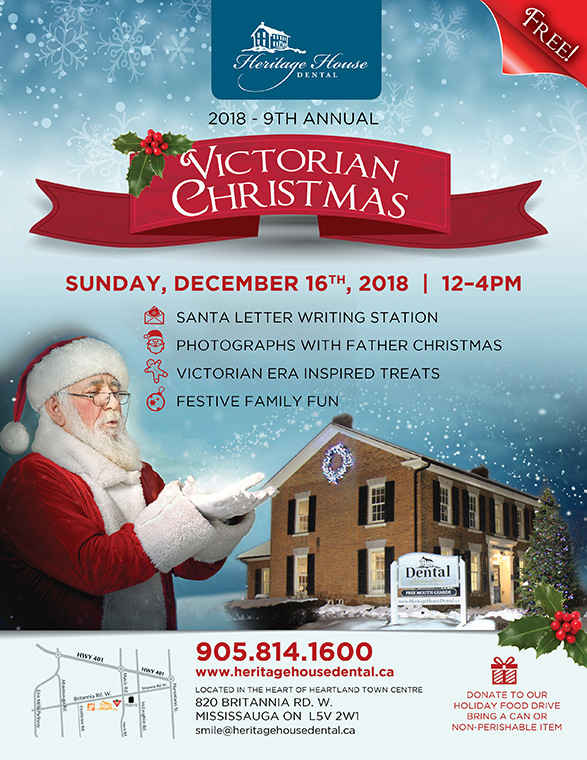 We can’t wait to see you at the 9th Annual Victorian Christmas Celebration! Be sure to view the video below of a previous Victorian Christmas. This entry was posted in Doctor's Corner, In the News. Bookmark the permalink.